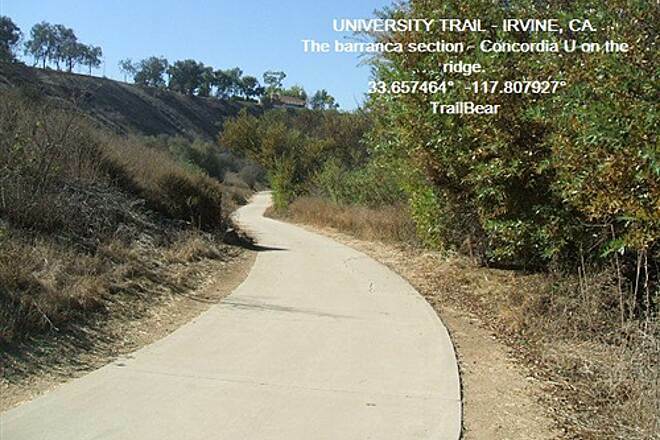 The scenic University Trail begins at a connection with the San Diego Creek Trail and runs east along University Drive through southern Irvine. 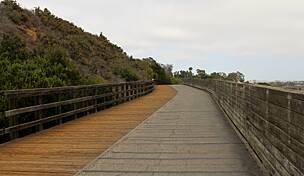 The trail stretches the length of William R. Mason Regional Park, which is divided by Culver Drive into two unique experiences: a landscaped picnic ground in the west and a wild barranca in the east. 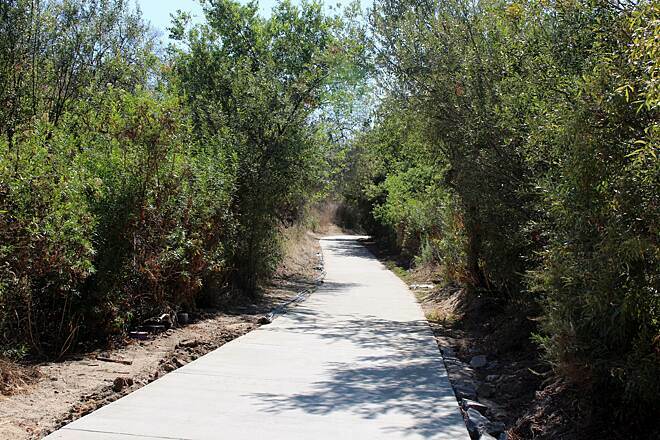 A paved spur to University High School serves commuting students, teachers and staff, while the route along the northern edge of the picturesque Quail Hill Preserve provides visual interest on the trail's eastern end. 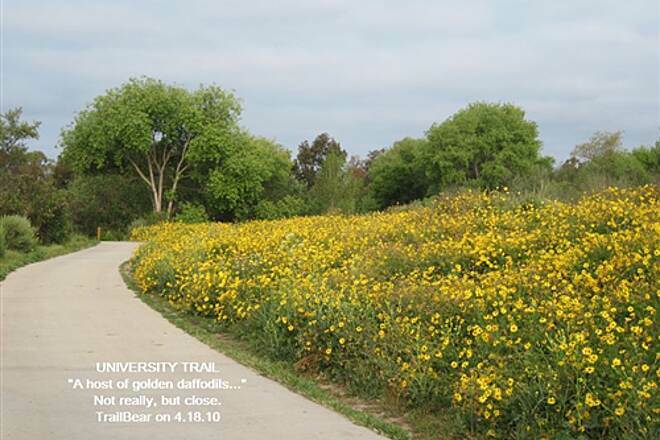 In addition to the connection with the San Diego Creek Trail, the University Trail directly links with a host of other trails, including the Turtle Rock Trail, Jeffrey Open Space Trail and Juanita Moe Trail. 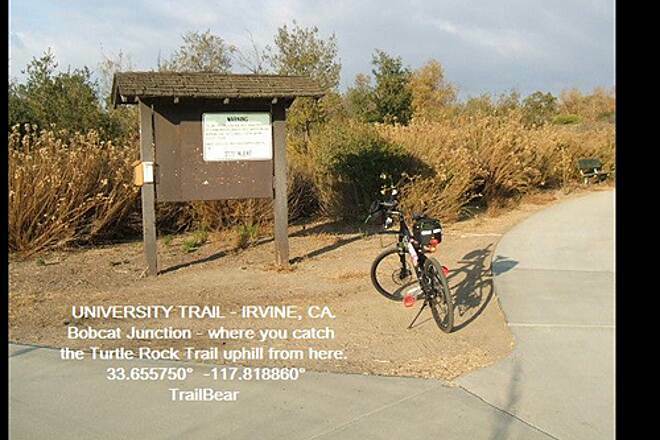 Parking for the University Trail is available at William R. Mason Regional Park in Irvine (18712 University Drive). Note that a parking fee is charged ($3 per weekday, $5 per weekend). After a busy week at work, TrailBear vows to Sleep In. The Saturday Ride is moved to Sunday to free up the day for late sleeping and slothful activities. Does it work? Not hardly. TB is wide aware at 0430, as usual. Nothing for it but to get up, get breakfast, read The WSJ and get going. However, it’s a great time to try an early morning ride before the day begins. Der Bear is on the trail at 0630, which is a bit late. He so wanted to try his new Magic Shine bike light in the dark. By now it’s the gloaming. However, being a firm believer in “Can you see me now?” and daylight headlights, he puts the light on strobe. A new Sette red flasher is velcroed to the back of the helmet. Set that one on strobe. You can see TB on the trail from some distance. Coming at you is a strobing white light. Going away is a strobing red light. You can tell something is out there and which way it is moving. The first of the five trail loop is the Back Bay Trail. TB hops on it up on Irvine and University and heads across the top of the bay. The trail is his. Where are the Roadies in their Suits of Light? Too early? Just one lone Latino, probably headed to a job. TB stands up the SDCT to the University Trail junction and then turns onto the UT through William Mason Park. The streets are empty, but the park ticket taker is on duty and has an early customer. Over in the barranca section of the park there is new planting. Those winding areas of slightly excavated soil seen there in fall are now crossed with irrigation pipes, new plants and sport Habitat Restoration signs. Wonder what they are growing. There is a whole meadow of Black Eyed Susans (?) in bloom across the trail. The only other traffic on the trail are grouse and the spring bunnies. The grouse head for cover. The bunnies wait for the Gutterbunny ’10 to get closer, then make a mad dash across the trail. 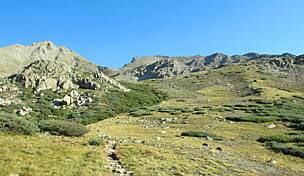 Some get confused in mid trail and turn back. The smart bunny just sits on the verge until TB goes by. Turn left at Water District Junction and head up the lower Woodbridge Trail. The streets are empty. Other people obviously can Sleep In. TB takes to the bike lane. 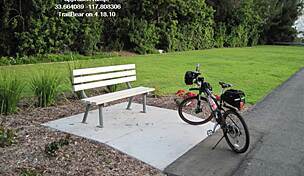 There is a new wayside with bench and plantings on the approach to the freeway bike bridge. It’s always nice to see waysides; we need more. Over the 405 freeway, down the other side, sharp turn and it’s now the Freeway Trail. TB tries pedaling like a Roadie. He gooses the Bunny up to 20.8 mph, then settles back into his favored lethargic pace of about 10-12 mph. Less work. Wonder where they go from the end of the Freeway Trail? The Culver Crossing is as exciting as ever. The walk light takes you to an island at the freeway on ramp. The on ramp traffic does not stop for the walk light or much else. They are probably doing 50 mph or better, so best be able to scamper. TrailBear does not scamper at all well, but makes it. 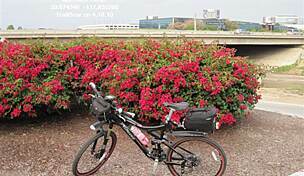 The bougainvillea are blooming along the landscaped section of the Freeway, behind the sound wall. The only other trail user is a lone dog walker. The Freeway Trail ends at the San Diego Creek Trail. Good place for a wayside plaza and one of those Irvine map-on-a-stick thingies. You could relax and watch the traffic on the SDCT. More traffic on the trail now. Runners are coming up the trail. Probably some are in the relay. TB sees identical water bottles and T shirts here and there. The early Roadies are out and moving. Time to head back to the Back Bay and the chores of the day. 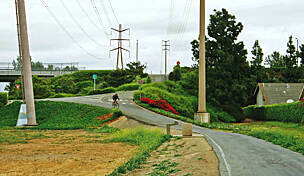 This was a pleasant 13 mile semi loop ride on five of the local trails in Newport Beach and Irvine. The nice thing about Irvine trails is the choices they give you. For a longer ride, take the University Trail out to JOST Junction, get on the Jeffrey Trail up to San Diego Creek and back that way. 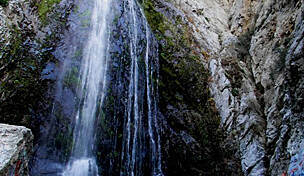 For some climbing, head past JOST Junction to get on the Shady Canyon Trail. 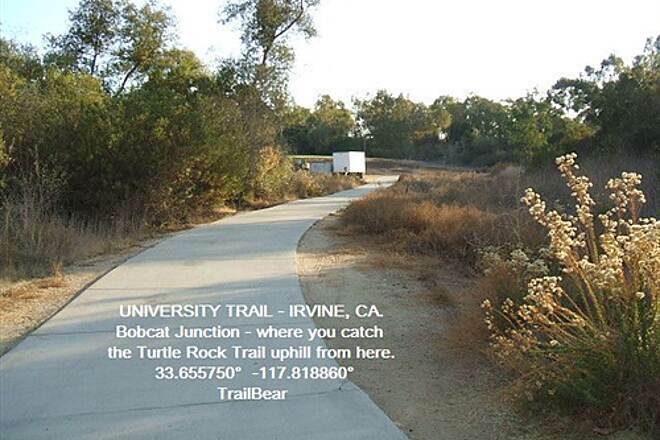 You can either come down the Bonita Canyon Trail to the University Trail or try the Turtle Rock Trail down to the UT. It has more climbing and a rocking descent. Decisions, decisions. Putting the icons on the map. The University Trail - short - but well connected. The University Trail is a short one with a lot of connections. IT's a like a fourth for bridge. It serves as the bottom of a number of loop rides. Someone has to do. The University and the Freeway Trails do it. Let’s start over at the Quail Hill Trailhead. 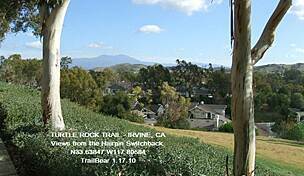 This is one of the few actual trailheads in the City of Irvine system. On most trails, we make do with nearby parks. It is a well done project with facilities for bikers, hikers and horses. It's free. TrailBear likes free trailhead parking. From Quail Hill you can go in two directions. 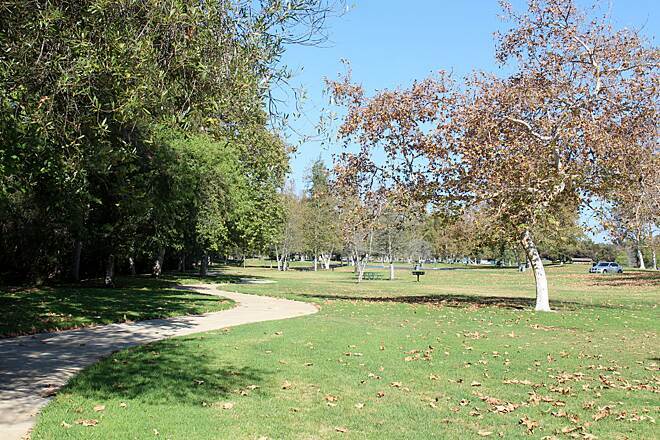 Uphill takes you to Gatehouse Pass and the gated community of Shady Canyon. 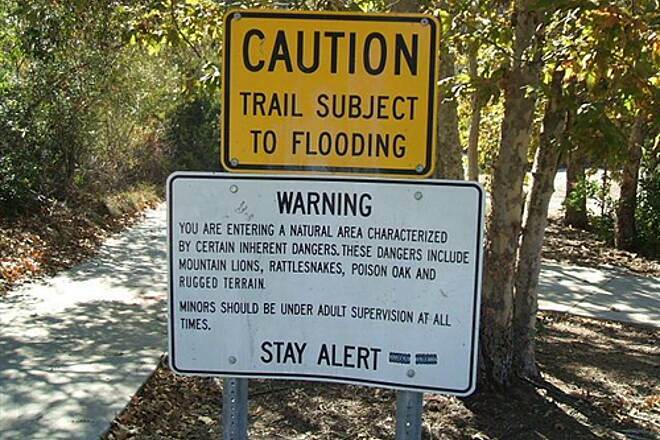 That puts you on the Shady Canyon Trail and a 9 mile loop ride back to Quail Hill. Go the other way. 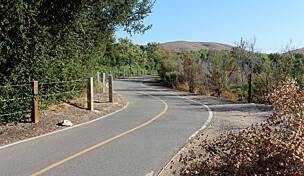 Take the Quail Hill bike trail back towards the freeway. It wraps around the bottom of the trail and heads for JOST Junction. 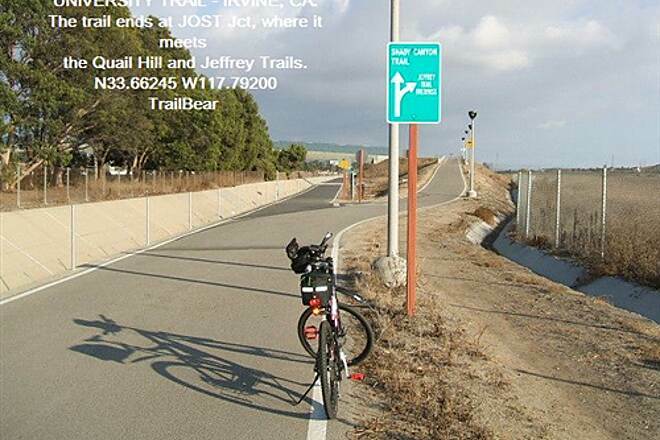 JOST – Jeffrey Open Space Trail – Junction is at the end of the bike/ped bridge over the freeway. Here the JOST, Quail Hill and University Trails meet. 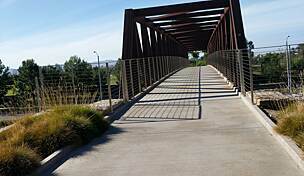 If you take the bridge, you can ride up the JOST to the San Diego Creek Trail or take bike lanes. There are a lot of options. 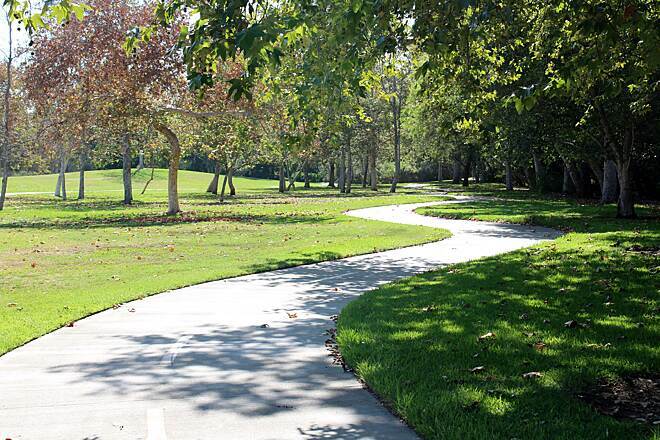 Check out the Irvine bikeways map. Since you are riding the University Trail, just continue on straight ahead, climbing alongside University Drive. You will crest out at Strawberry Farm Rd. There is a water fountain between Strawberry Farm and Ridgeline Dr. You traverse the Sand Canyon Wash between the two roads. If you travel up the wash you will reach the Sand Canyon Reservoir at the far end of the golf course. Cross Ridgeline at the light. Now, where did the trail go? No signs. Take a left up the bike/walk and you will find the entrance 0.07 miles uphill, below a ridge. You hope the name is not trying to tell you something, but watch where you walk. Rattlesnake offers two choices. There is a bike/walk to the left that leads up to the University High School and a bike/walk to the right that lead to Culver Dr. 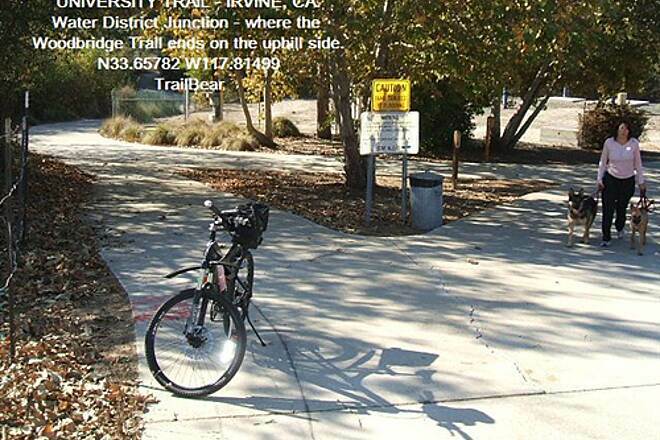 If you are doing the Shady Canyon Loop, take the sidewalk up Culver to Campus Dr. The Bonita Trail is on the left side of Campus up there and will take you up to the Shady Canyon Trail, which will return you to Quail Hill. Since you are riding the UT, backtrack to the junction below Rattlesnake and bear left. This takes you to the ped crossing at Culver & University. You might hope for some informative signs at these junctions about which leg goes where. It has yet to happen, but you can hope. Cross and bear left onto the trail entering the civilized portion of William Mason Park. Certainly a change from the barranca: mowed lawns, a lake, restrooms, a fee station, parking, pleasant walks, picnic shelters, tot lot, etc. You’ve done it! 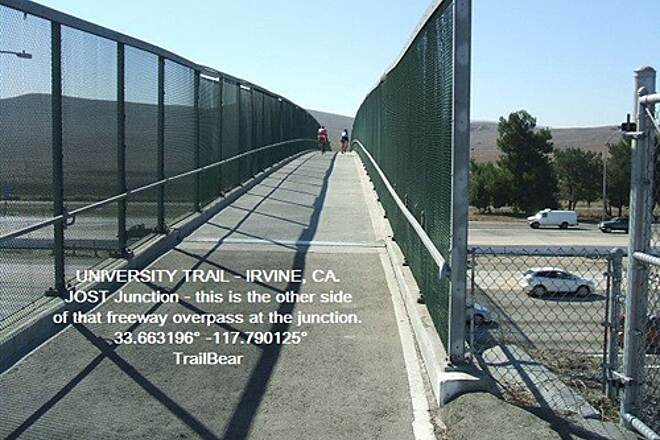 Traversed the entire University Trail from JOST Junction to the San Diego Creek Trail Junction. (Three miles and change, but you don’t have to stress that point.) A word of caution: The junction is something of a blind corner. Stop, look and proceed with care - or risk getting trampled by a pace line of roadies coming around the corner. 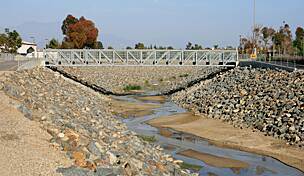 You are now on the San Diego Creek Trail, about 12 miles long and the backbone of the Irvine Class I trail system. So many choices! 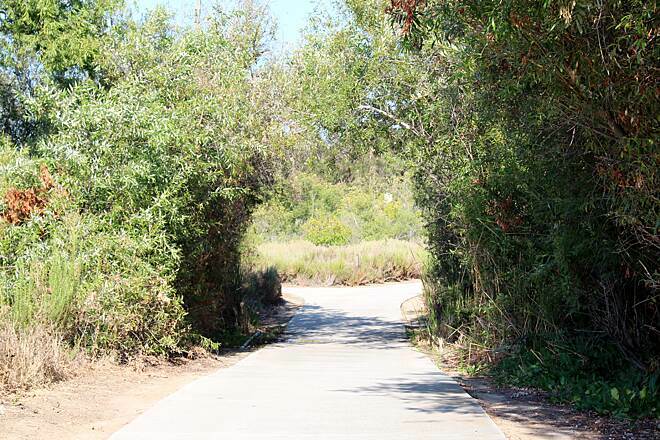 Turn left and ride over to the Back Bay Loop in Newport Beach. Turn right and you are about 2.4 miles out of Bill Barber Park and a junction with the Peters Canyon Wash Trail to the north. You can ride the SDCT past the park and intersect the Woodbridge and the JOST, both of which will take you back to the University Trail. 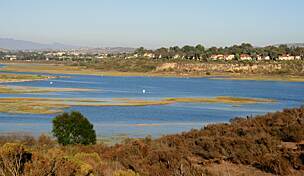 If you want a short loop, take the SDCT up to the Freeway Trail and the FT back to the Woodbridge or the JOST and those down to the University Trail and thence to your car at Quail Hill. Trail Surface = ***** Nice, smooth ride. 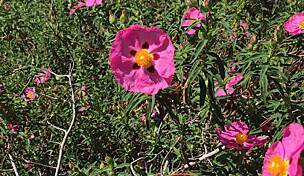 Good concete surface. About 11’ wide. Scenery = *** It's O.K., but does not stir the heart. You are not riding it for the views.